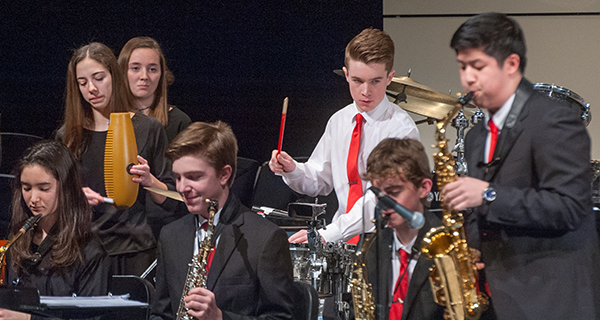 The Medfield High School Music Department’s Jazz Winterfest took place on Wednesday, January 23, at the school’s Lowell Mason Auditorium. Both the Jazz Choir, under the direction of Ann Marie Tremblay, and the Jazz Band, directed by Jason Bielik, performed a variety of music with intricate harmonies, outstanding ensemble singing and playing, and enthralling solos. The Jazz Choir began with a sweet and lyrical “Smile” by Charlie Chaplin and arranged by Ben Braum. The next piece, “Hymn of Acxiom” by Vienna Teng, arranged by Kerry Marsh, was a contemporary take on the Information Age. Acxiom is a company that specializes in utilizing what it calls “people data” in marketing, and the hymn’s lyrics reflect on the everyone’s loss of privacy because of the dissemination of private information on the Internet. Dissonance was used to good effect in characterizing this modern dilemma. The Jazz Choir’s final piece, “Orange Colored Sky” by DeLugg and Stein, arranged by Deke Sharon, was a hip and swinging piece with clever lyrics. Both soloists delivered their choruses with style and energy. The Jazz Choir used individual cordless microphones for the first time in this concert, and the sound was gorgeous. Their blending was so accomplished that it sounded like there was one voice on each vocal part, which is hard to do. 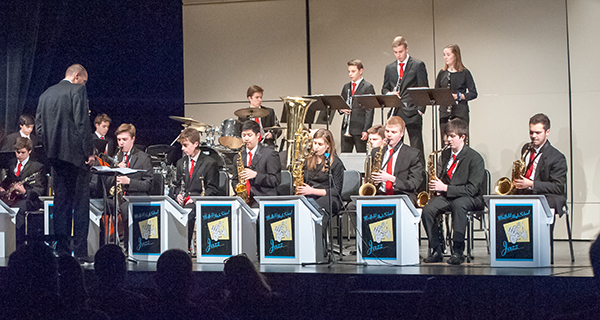 The Jazz Band started out with the smooth “C Jam Blues” by Duke Ellington and Irving Mills. Several engaging soloists took impressive turns at improvising, including Evan Volkin on clarinet, Michael Downing on guitar, Thomas Shurtleff on alto saxophone, Juliana Hoernle on tenor saxophone, Joe Pagliazzo on trombone, and Tristan Marble on clarinet. The next two pieces, “Again and Again” and “Symphony in Riffs,” both by Benny Carter, featured two outstanding soloists. Ethan Ni, on alto saxophone, displayed a fine sense of phrasing and tone. On piano, Francis Brooke spun out melodies with liveliness and energy. The third piece, “But Not for Me” by George Gershwin, arranged by Scott Ragsdale, featured a strong, swinging vocal solo by Alana Potts. Her delivery was marked by a clear, straight-on tone with perfect sliding into and embellishment of phrases. The Medfield High School Jazz Band, directed by Jason Bielik. Finally, the last piece, “Esperanto” by Doug Beach, featured a Latin jazz vibe that was intoxicating. Jack Shurtleff displayed his fine skill in Latin percussion throughout the piece, and kept the party rolling in a lively solo. Lukas Donner, guitar soloist, and Ethan Ni, alto saxophone soloist, embellished the lively tune with fine improvisations. Medfield High School is known for having an excellent jazz program, and this reputation was underscored by the Winterfest concert. If you are a fan of jazz, you would certainly enjoy attending their next concert.